The Aix-en-Provence old town is enchanting: shady squares, elegant town-houses, lively open-air markets, … everything contributes towards making this Provençal town a memorable visit. Follow the guide! Nicknamed the “City of a Thousand Fountains”, Aix-en-Provence owes its name to the ancient water sources used by the Romans. Indeed, the visitor cannot miss the beautifully ornate fountains which decorate its streets and intimate squares when discovering “Le Vieil Aix”, the old town. Paris has its Champs-Élysées, Nice its Promenade des Anglais, Marseille its Canebière and Aix its Cours Mirabeau. This wide street is one of the busiest and most frequented in Aix-en-Provence. Delimited by the Place de la Rotonde (West) and Place Forbin (East), it was and remains the best part of town to be seen. 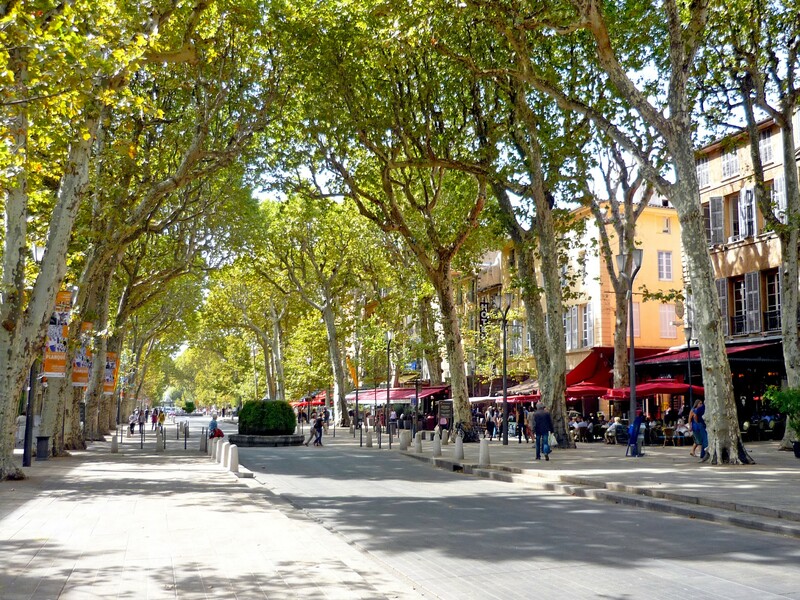 Le Cours Mirabeau is a tunnel of plane trees punctuated with fountains and lined with cafés, terraces and elegant private mansions with iron-wrought balconies: Cours Mirabeau certainly contributes to the fame of Aix-en-Provence. The street is 440 metres long and 42 metres wide and underwent an extensive rejuvenation in 2002 to make it more suited to pedestrians. Find out more about the Cours Mirabeau. This square encloses Cours Mirabeau to the East and was named in the Middle-Ages as Place des Carmélites after a fountain which belonged to the Carmelites of Aix. This square is bordered to the South by the Oblats Chapel whose façade was built in 1697 by Laurent Vallon. In the 16th century, at the actual site of the Chapel, there used to be a little garden dominated by a pine tree around which the Huguenots used to pray. In 1562 during the Wars of Religions, several of these Protestants were hanged from that pine. Later on, orders were given to cut down the tree before a Carmelites convent was eventually built there. Between Place Forbin and Place Miollis to the East of Cours Mirabeau, the street is lined with some interesting private mansions. The area is sometimes referred to as the Villeneuve District. Number 18, is also known as the mansion of Antoine Venel, Benault de Lubières or Piolenc. It was built in the mid-17th century by Pavillon and Rambot for Jean-Louis d’Antoine, advisor to the Court of Audit. When Louis XIV stayed in Aix, Olympe Mancini, countess of Soissons resided in the mansion. Located at number 26, this Baroque mansion was completed in 1690 by architect Louis Jaubert and features giant fluted pilasters. The monumental door and its columns contain several friezes adding a certain charm to the building. At number 28, a plaque on the façade reveals that this was the place where painter Paul Cézanne was born on 19 January 1839. This 18th century mansion is situated off rue de l’Opéra, at number 16 rue Émeric David. Built in 1739 for Henri de Thomas, Marquis of La Garde, councillor to the Parliament, the mansion features a superb door with mascarons and fine wrought-iron balconies. When Cours Mirabeau was laid out in 1649 on the site of the southern rampart, the Archbishop of Aix, Michel Mazarin, had in mind to extend the boundaries of the town With the help of urban architect Jean Lombard and with the consent of Louis XIV, a new district to the South of the old town was born: Quartier Mazarin. The 17th century district represents a third of the total area of Aix and distinguishes itself from the rest of the old city by its check pattern map. Members of parliament and the bourgeois of the time built private mansions there, punctuated with adorned fountains. The district’s heart is Place des Quatre-Dauphins (formally Place Saint-Michel) and is organised on two principal axes: rue Cardinale and rue du Quatre Septembre. The memory of Michel Mazarin has remained alive to today in the names of four streets: rue Cardinal (which bears the name of his brother’s title), rue Saint-Michel (today rue Goyrand, his first name), rue Mazarine, and rue Saint Sauveur (today rue du Quatre Septembre, as he wanted a street to carry the name of Aix Cathedral). Today, the Mazarin District with its great perspectives and straight line streets is one of the most residential in Aix-en-Provence. It is reputed for being calm, tidy and a teeny bit posh! At the crossroads between rue Cardinale and rue du Quatre Septembre, the square is locally appreciated for its fine fountain. Four private mansions were built at each corner of the square. The fountain features four dolphins spurting water into a basin. It was built by Claude Rambot who found its inspiration in Italian Baroque, particularly the Piazza Navona fountain in Rome. The fountain portrays the illusion of movement and comprises four elements: a circular basin, the four sculptured dolphins, an obelisk and a pine cone. The latter was successively replaced by a fleur-de-lys and a Maltese cross. The fountain has been listed as a “Monument Historique” since 1929. The mansion at number 3 rue Joseph Cabassol was constructed between 1715 and 1742 by Georges de Vallon based on the plans of Parisian architect Robert de Cotte for François Rolland de Tertulle, the Lord of Réauville and Marquis de Cabannes, president of the Court of Audit. Similar to the Hôtel Boyer d’Éguilles, the Caumont Mansion was influenced by the Parisian style as the main building is separated from the street by an enclosed courtyard and a carriage gate. The main façade of the mansion displays a certain Classical style fashionable in France in the 18th century. Its simplicity and sobriety are demonstrated in vertical and horizontal lines. The large first-floor window and its wrought-iron balcony are surmounted by a rounded pediment carrying the coat of arms of the Bruny de la Tour d’Aigues family, the second owners of the mansion. The second-floor window is again topped with a triangular pediment. The roof of the mansion however did not follow the Parisian style and is definitely of Provençal style with four gentle slopes. During the Second World War, the caretaker of the mansion, Hélène Ardevol (1892-1976), helped many French resistance fighters by hosting them in the rental flats. A commemorative plaque pays tribute to her courage at the entrance of the building. Today, the mansion houses the Conservatory of Music and Dance Darius Milhaud. The Hôtel de Caumont was listed as a “Monument Historique” in 1990 and is under restoration until April 2015. At the corner of rue d’Italie and rue Cardinale, the St. John-of-Malta Church was probably built from 1272 to 1278 on the site of a former sanctuary dedicated to the Hospitallers in the 11th century. The church is known for being the first Gothic sanctuary to be erected in Provence where Romanesque style was the rule. The lower part of the bell tower is set on a massive square and supported by buttresses. The first floor is punctuated by four tall narrow windows and houses the unique bell. Above, the spire is surrounded by four turrets which contain eight dormer windows. In the Middle-Ages, the bell tower was crowned by a metallic cob topped with a Latin cross. In 1754, the cross was destroyed by lightning and was replaced by a Maltese Cross. Reaching 67 m high, the tower is Aix’s tallest building, even surpassing the cathedral. The side chapels bordering the vaulted nave used to host the rich tombs of the Counts of Provence and the House of Barcelona. On Place Saint Jean de Malte, the former palace of the priory of St John of Malta now houses the Granet Museum. The Granet Museum exhibits permanent collections which makes it one of the richest French museums outside Paris. The museum was created in 1838 when François-Marius Granet (1775-1849), a painter native to Aix, donated to the town most of his work which has been kept here ever since. The visitor can admire major works of French painters from the 16th to the 20th centuries, as well as masterpieces from the Dutch, Flemish and Italian schools. Renovated in 2006 for the centenary of the death of painter Paul Cézanne, the Museum receives nearly 180,000 visitors each year. At the top of rue Thiers lies a district made up of important landmarks for Aix-en-Provence: the Court of Justice, the St Madeleine Church, as well as two connected squares: Place de Verdun and Place des Prêcheurs. The two squares hold outdoor morning markets on Tuesday, Thursday and Saturday. The Court of Justice is situated in the busy Place de Verdun. A state owned property, this massive building was the site of the residence of the lords of Provence, then the Parliament of Provence and the Court of Auditors. The former palace was destroyed at the end of the 18th century and was rebuilt by architect Penchaud between 1825 and 1832. Today it houses the Court of Appeal of Aix-en-Provence. Located at number 2 on Place des Prêcheurs and at the corner of rue Thiers, stands the recently restored private mansion of Agut. The fine door made of walnut was installed in 1676. It is flanked by two atlantes who support the balcony. The mansion was built in 1676 by Pierre d’Agut, counsellor to the Parliament and is a remarkable example of Baroque architecture in Aix. A statuette of the Virgin is visible at the corner of the building leading into an oratory. In the 15th century, the Place des Prêcheurs was built by King René and became a fashionable centre of the town before the creation of Cours Mirabeau. The Place des Prêcheurs is decorated in its centre by a monumental fountain by Chastel. It features an obelisk supported by lions. The obelisk is surmounted by a sphere, itself topped by an eagle with spread wings. It was on this square that an effigy of Sade was hanged in protest. The St Madeleine church borders the eastern side of the square. The 19th century façade of the St. Madeleine Church is not particularly interesting. The church was built in the 16th century on a site corresponding to the old domain of the Dominicans whose convent was located just next door. The “royal quarter” where the Counts of Provence resided was also situated around the square. There is a fine collection of religious paintings inside the church and in particular an altarpiece from 1445 by Barthélémy d’Eyck known as “Master of the Annunciation of Aix”. From Place des Prêcheurs to Place d’Albertas, the old town of Aix reveals itself on a stroll through the “Chemins de Traverse“, the sideroad crossings. The rue de Montigny leads to the small square of Place des Trois Ormeaux. A fountain, three trees and façades from the 17th century: this elegant little square used to be known in the past as Place Bertrand Bérici after Aix’s Consul who lived here at the beginning of the 15th century. The Place owes its current name to the three elm trees which were planted here (ormeaux in French) which have since been replaced by the more traditional plane trees. Initially, the square was the site of a horticultural market. The beautiful sculpted door of the Hôtel de Saphallin (at number 5) dates back to 1672. A Madonna and Child statuette is located at the corner of rue des Épineaux. The old town of Aix has more than 60 religious statuettes strategically placed at the corner of streets leading into an oratory: there are mostly Virgin statues dating from the 17th to the 19th centuries as well as a few other Patron Saints such as St Roch. The influence of Catholicism was strong in the town until the French Revolution. Many religious orders were present and a servant of Satan was burnt within the wall in 1611! The discreet fountain was built in the 17th century. Water spurts out from four canons where a well was previously located. From Place des Trois Ormeaux, rue Jaubert and rue Chabrier leads to Place Richelme. Rue Méjanes is to the left, just before entering Place Richelme. Rue Méjanes leads the visitor to the small Place des Chapeliers through the sideroad crossing. Chapeliers refers to the hat trading that used to take place here. Before entering the rue des Bagniers on the right, notice the small fountain of Bagniers. Set against the wall, it was originally built in 1685 and transferred to its present location in 1759. A bronze medallion framed by fruits and flowers drawn by Renoir was recently placed on the fountain representing painter Paul Cézanne. The little fountain was listed as a “Monument Historique” in 1949. This narrow street links rue des Chapeliers to the small Place Saint-Honoré. Rue des Bagniers is known in Provençal dialect as “leis Bagniers Rédiers” meaning the Last Baths Street, a reference to the thermal activity of Aix. In the shade of the plane trees. this charming little square is decorated with a fountain. At the corner of rue des Bagniers and Marius Reynaud stands the statuette of St Honorat leading into an oratory. The Patron Saint was the bishop of Arles and was said to have resuscitated the daughter of a friend in a house on the site of the square. Pierre Honoré had the house where the miracle occurred dismantled in 1713 to lay out the present day square. The St. Honoré fountain, also known as Fontaine Marcello Drutel is dedicated to the Provençal poetess Marcelle Drutel whose literary pseudonym was Aubanelenco. The narrow rue Clemenceau leads to Cours Mirabeau and was formerly called rue de la Miséricorde. At number 7 the Hôtel de Meyronnet de Châteauneuf was built in the 17th century for Philippe de Meyronnet, counsellor to the Court of Audit. Its front door is flanked by two ionic columns. Running from Place Saint Honoré to Place du Général de Gaulle (Rotonde), the busy shopping street of rue Espariat is bordered by some interesting monuments and landmarks: the Hôtel Boyer d’Éguilles – now the Natural History Museum, the elegant Place d’Albertas, Église du Saint-Esprit, Place des Augustins and a number of fine private mansions. At 6 rue Espariat, listed as a “Monument Historique” in 1988, this private mansion hosts Aix’s Natural History Museum (Muséum d’Histoire Naturelle). Built by Jaubert between 1672 and 1675, the baroque mansion has a forecourt and a monumental portal tall enough for letting carriages enter the courtyard. This specific layout is quite rare in Aix-en-Provence and denotes a Parisian influence. The façade has been planned with elegance: it is rhythmically punctuated by monumental fluted pilasters and the entablature is decorated with rosettes. The Museum was founded in 1839 in the Town-Hall and reopened in the present premises in 1953 following the purchase of the mansion by the municipality. Welcoming some 30,000 visitors each year, the museum exhibits an impressive array of paleontologic, zoological and ethnographic collections. Here, a unique dinosaur fossil collection from the nearby Sainte Victoire Mountain can be viewed. Almost facing the Natural History Museum lies the elegant Place d’Albertas, certainly one of the finest examples of baroque architecture in Provence. Find out more about Place d’Albertas. Formerly known as St. Jérôme Church, it was built between 1706 and 1728 by the Vallon brothers on the site of the Holy Spirit Hospital, devoted to the cause of lost children. It was inside the church that the wedding of Mirabeau to Mademoiselle de Marignane was celebrated. Its plain façade features pillars whose vertical lines reinforce the austerity of the Classical building. In the left arm of the transept is a triptych of the Annunciation painted by Barthélémy d’Eyck (1444), commissioned by Pierre Corpici, a private supplier to the Prince’s Court. The church was listed as a “Monument Historique” in 1985. The Augustinian Convent was founded during the Middle-Ages. Its bell-tower dates back to 1472 and features a squared tower followed with an octagonal level. The refined wrought-iron dome was added in 1667 in order to avoid the strong mistral wind making the bells rings. The convent’s estate was sold at the time of the Revolution. This square takes its name from the former cloister of the Augustinians located on rue de la Masse. The elegant fountain is one of four in the town to have kept its water coming directly from springs. It was designed by Bessain and built in 1820. On a stone base, a circular basin is surmounted by a roman column (a remnant of the former Count’s Palace) topped by a 12 pointed-star in brass. From the square it only takes one minute to reach Place du Général de Gaulle and its monumental Rotonde Fountain. In less than 170 metres, the narrow shopping streets of Rue Aude and rue du Maréchal Foch link Place d’Albertas to Place Richelme. At number 13 Rue Aude, opposite Rue de la Glacière stands the Hôtel Croze Peyronetti built by Jean Lombard around 1620 in Italian Renaissance style. The façade of the mansion shows a marked contrast between the heavy vermiculated forms around the portal and the more delicate aspect of the upper floors with its fine frieze. This example of mannerism gives a strange and surprising look indeed to the building. A bit further, between Place Richelme and Place de l’Hôtel de Ville and opposite the Corn Exchange Hall stands the Hôtel d’Arbaud (7 rue du Maréchal Foch) with an interesting portal. Two stone giants support the wrought iron balcony, evoking the atlantes of Hôtel Maurel de Pontevès on Cours Mirabeau. This charming little square hosts a few cafés where one can sit in the shade of spreading plane trees and sip a French café noisette or a glass of mauresque cocktail (pastis mixed with orgeat syrup). Bordered by the former Corn Exchange Hall, Richelme square was previously named Place aux Herbes because it has become a market place where gardeners and farmers have sold their fresh produce every day since the 14th century. At the end of the 14th century, King René built a chapel there dedicated to St. Sebastian. The sanctuary was eventually dismantled in 1618 to make way for a Fish Hall which was later knocked down. In the 19th century, the square was renamed after an internationally famous Opera tenor native to Aix: Louis-Ferdinand Richelme (1804-1845). The daily market on the little square is one of the town’s most colourful ones where fresh vegetables and fruits, cheese, olive oils, condiments, tapenades, anchoiades (anchovy purées), fougasses and other Provençal specialties can be found. This is arguably one of Provence’s most famous squares with a great array of architectural styles, from the most simple to elaborate baroque styles. A few famous monuments border the square: the Town-Hall, the Corn Exchange Hall and the Clock Tower. A flower market takes place in the square on Tuesday, Thursday and Saturday and an Old Book Fair on the first Sunday of the month. Find out more about Place de l’Hôtel de Ville and its monuments. Also called “Forum des Cardeurs”, the 170 metre long square was laid out in 1963 where a block of decrepit houses was demolished. The square’s boundaries correspond, more or less, to the former Jewish district of the Middle Ages. Bordered with typically renovated Provençal houses with their colourful façades and decorated with a fountain by Jean Amado (1977), the square is nowadays a smart area with restaurants and cafés whose terraces cover half the square, hence creating a very nice overall atmosphere, somewhat reminiscent of Italy. At the bottom of the square lies another, much smaller square: Place des Fontêtes. In Provençal dialect, “Fontêtes” means “small fountains” and indicates that water flows abundantly here. The waters of the hidden springs were collected in a common well that has since been replaced with the current fountain. Although it is openly connected to the busier Place des Cardeurs, this little square still offers a more intimate atmosphere. The narrow and busy street that links the Clock Tower to Aix Cathedral is named after Louis-Charles-Joseph Gaston de Saporta (born in 1823 in the Var département), a famous paleobotanist, who died in 1895 in Aix. His work contributed to our knowledge of the transformation of plant species across the ages. The district between the cathedral and the Town Hall is also named “Bourg Saint Sauveur” and occupies the site of the former Roman town. A few narrow streets have kept evocative names from the Middle-Ages: rue du Griffon or rue Esquicho-coudo (“squeeze the elbows” in Provencal). The remains of the old medieval ramparts of Aix are still visible on rue des Guerriers. The 170 m long street is bordered by some interesting and historic private mansions. Located at number 17, Hôtel d’Estienne-de-Saint-Jean was built around 1671. It takes its name from François d’Estienne, Lord of Montfuron and from Saint-Jean-de-la-Salle who lived there. During the events of the Catholic League of France, d’Estienne, who called himself a Protestant, had taken sides with Henri III, then Henri IV which forced him to flee to Aix. In the 17th century, one the descendants of d’Estienne, Françoise d’Estienne-de-Saint-Jean, married Joseph de Martigny, general treasurer of France. In 1671, Joseph commissioned the reconstruction of the present edifice which belonged to his wife. The staircase and the painted decoration on the ground floor date from this time. The façade was built between 1679 and 1681 with fluted pilasters and corinthian capitals. The door dates from the 18th century and is surmounted by a pediment. The work was generally attributed to Pierre Puget who also worked on Hôtel d’Éguilles and Hôtel de Grimaldi-Régusse. However, it seems in all likelihood that Jean and Laurent Vallon were the principle architects. The private mansion came into possession of the City of Aix in 1922 when it was given as a legacy by Marie d’Estienne. The Old Aix Museum (Musée du Vieil Aix) opened its door on the site in 1933 and was listed as a “Monument Historique” in 1937. It houses the collections gathered by Marie d’Estienne-de-Saint-Jean representing the traditions of Aix and the surrounding Provençal region. The next house, located at number 19, is named after Jean-François d’Albi, Baron of Châteaurenard and counsellor to the Parliament. The former residence had belonged beforehand to the Lords of Canet. The Baron had the private mansion rebuilt in the mid-17th century by Pierre Pavillon. It contains a superb banistered staircase decorated with trompe-l’œil paintings from Jean Daret, a native of Brussels. The private mansion had its moment of glory in 1660 when the young Louis XIV resided here during his stay in Provence from January to March 1660. Rumour has it that the Sun King liked the work of Jean Daret, rewarded him with the prestigious title of “King’s painter” hence launching his successful career. Opposite Hôtel Boyer de Fonscolombes is a little square sheltered by a plane tree and bordered with the terraces of cafés: this is Place des Martyrs de la Résistance. At the edge of the square stands the impressive façade of the Archbishop’s Palace (Palais de l’Archevêque) with the heavy sculpted tympanum above its door. As a prince of the church, the Archbishop played a significant role in the city life of Aix-en-Provence and enjoyed political importance before the French Revolution. In the 17th century, Archbishop Michel Mazarin, brother of the powerful Cardinal Mazarin, became completely involved in the development of the Provençal town and its surrounding region. The present day palace was built between 1650 and 1730 by architect Laurent Vallon. The monumental façade features three levels punctuated by large windows. The portal itself looks more like a triumphal arch than a simple door to the edifice. Today, the Archbishop’s Palace houses the Tapestry Museum (Musée des Tapisseries) and its collection from the 17th and 18th centuries, in particular some masterpieces from the Beauvais workshops and a cycle of Don Quixote scenes. At 21 rue Gaston de Saporta is the mansion of Boyer de Fonscolombes and its austere façade in dressed stone. Built in 1650 for Charles de Grimaldi-Régusse, President of the Parliament, the private mansion was then bought by Honoré Boyer de Fonscolombes who redesigned it for his eldest son. The carriage gate, with its lowered arch shape, leads to an inner courtyard decorated with a fountain. A monumental staircase runs to the first floor and to a gallery covered by a golden-modillion ceiling leading to two apartments with 18th century decorations. At the corner of rue Gaston de Saporta and Place de l’Université stands the Hôtel de Maynier d’Oppède (number 23). The site was acquired in 1490 by Accurse Mayner, Baron of Oppède, who became the first President of the Aix Parliament in 1507. In 1660, Cardinal Mazarin resided in the mansion during Louis XIV’s visit to Provence (the Sun King stayed at the neighbouring Hôtel de Châteaurenard). In 1730, the mansion was sold to the Thomassins, Marquis de Saint-Paul who enlarged the building in 1757. The façade was reconstructed by Vallon and decorated with corinthian pilasters, a dentilled cornice and windows adorned with mascarons. Inside, the architect added the vestibule and the staircase decorated by Chastel in the fashion of the time. The Aix Faculty of Arts had its headquarters here from 1846 until it moved to new building in the Fenouillères district in 1950. The building still belongs to the university and hosts the Institut d’études françaises pour étudiants étrangers. On Place de l’Université, this fine mansion built of beautiful dressed stone facing the cathedral, was the former Law Faculty. In 1409, the Pope authorised the creation of Provence’s first university. The presence of the institution in Aix was significant and it resulted in the city becoming one of the most active educational areas in the country. The first building, dating from around 1604 and designed by Pierre Laurens and Esprit Boyer, was destroyed despite several attempts at restoration. The present building dates back to 1741 and was built by Georges Vallon. The façade features a colonnaded projection surmounted by a pediment decorated with the allegory of justice. Paul Cézanne was enrolled as a student there from 1858 to 1860. The Law Faculty moved out to a new location in 1950 and the building currently hosts the Institut d’Études Politiques (Sciences Po). 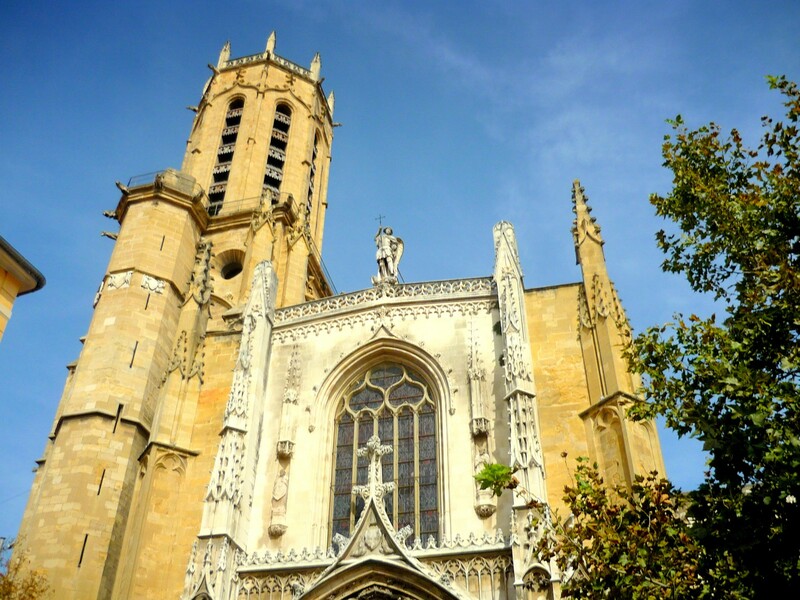 A sacred place for thousands of years, the cathedral of Aix-en-Provence has become a religious landmark in the region. The imposing church features large proportions combining three styles of architecture (Romanesque, Gothic and Baroque) with a few elements taken from the Roman era. Today, Aix Cathedral is listed as a national monument and its location in the Old Town makes it one of the most visited in the Provençal town. Find out more about Aix Cathedral. After the death of his mother and the sale of the familial estate, Cézanne bought a plot of land on Chemin des Lauves in 1901, where he had a workshop built. There he created some of his most famous works, such as Les Grandes Baigneuses. In 1921, 15 years after Cézanne’s death, Marcel Provence bought the studio in order to safeguard “a precious heritage, a spiritual treasure attached to these walls, and to this garden”. Thanks to funds collected in the United States, the studio was bought from Marcel Provence’s heirs in 1954 and donated to the University of Aix-Marseille. The workshop is more than a museum. It is a place of remembrance which has retained the artist’s furniture, model objects of his still life works, a few water paintings and original drafts. The visitor can still stroll in the garden and be inspired by the intimate world of Cézanne. Located at number 13, rue de la Molle to the West of the old town, this is arguably Aix-en-Provence’s most beautiful mansion. With its elegant formal garden, the elegant townhouse was built in 1665 for Louis de Mercœur, Duke of Vendôme who had become Governor of Provence in 1652. Legend has it that it was originally built to facilitate his love affair with the Belle du Canet, alias Lucrèce de Forbin Solliès, widow of Honoré de Rascas, Lord of Canet. The Belle would join her lover at nightfall with her companions, their faces masked. The Duke wished to marry her but this plan did not please Louis XIV for Mercœur was at the time widower of Laure Mancini, niece of Cardinal Jules Mazarin. This would have been seen as a misalliance, therefore the Duke and the lady remained lovers. The Vendôme Pavilion is one of the finest examples of Neo-Classical architecture in Provence. It was built out of yellowish stone from the Bibémus quarries located to the east of Aix-en-Provence. Originally, the building comprised only one level above the ground floor with a long frieze supporting a Mansart style roof. The exterior decorations superimpose Doric pilasters on the ground floor, Ionic pilasters on the first floor and Composite pilasters on the second floor. The main entrance of the pavilion is flanked by two Atlantes by sculptor Jean-Claude Rambot made from the white stone of Calissanne. The Baroque statues, allegories of Dawn and Dusk, support a iron-wrought balcony for in Greek mythology, the titan Atlas was condemned by Zeus to support the heavens until the end of time. The fruit garlands and the mascaron of the portal represent summer. The two empty consoles on the second floor used to house the busts of the King and the Dauphin until the Revolution. The original plan of the pavilion, by architect Antoine Matisse, contained a gallery followed by a simple staircase. Around 1682, the pavilion became the residence of lawyer De la Molle who got rid of the Mansart roof and added a second floor to the building. The top of the pavilion was covered with Roman tiles. He also commissioned the creation of two sitting rooms on the ground floor and had the discreet staircase replaced by an “escalier de vanité”. This opulent feature, which can be observed in mansions across Provence, is significant due to its prominent situation and its size. In the 18th century, it could occupy up to a quarter of the entrance’s area and therefore became the symbol of the power and wealth of the owner. In the mid 18th century, painter Jean-Baptiste van Loo acquired the estate and set up his workshop on the second floor. In the 19th century, Henri Dobler redesigned the formal gardens according to their original layout in order to highlight the mansion’s architecture. The Catholic sisters used the estate as a nursery until the beginning of the 20th century and the small building to the right of the Pavilion was used as a chapel. In 1906, the pavilion was bought by Swiss art lover Henri Dobler who commissioned its restoration and tried to recreate the original furniture. At his death in 1941, his collection was donated to the municipality of Aix. The building belonged to his widow until she passed away in 1954 and the whole estate eventually came into the possession of the city. Today, it hosts the Dobler Museum with exhibitions of contemporary art and photography. The mansion has been listed as a “Monument Historique” since 1914, the gardens and the outbuildings since 1953. The current thermal baths are located in the heart of the old town of Aix on the site of the ancient Roman thermae. The Roman remains of a thermal pool are still visible at the entrance to the complex. The naturally heated water springs out at a temperature of 34 degrees celsius. Aix’s waters are oligo-metallic, faintly salted and mineralised. The waters are used to treat venous trouble, rheumatic fever, nervous problems and cellulite. This water flows into the town’s 40 fountains built from antiquity to modern times. 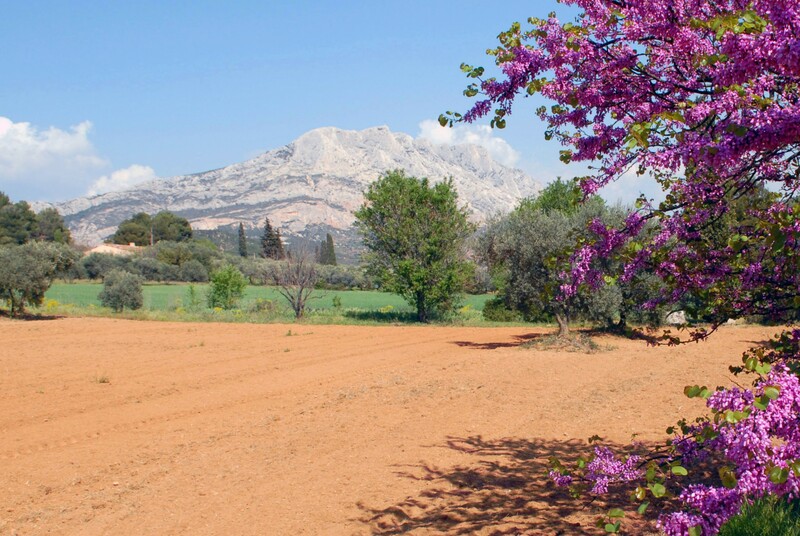 Aix’s iconic natural landmark, Montagne Sainte-Victoire is a white limestone mountain range which extends over 18 kilometres east of the city. Reaching 1,011 metres at Pic des Mouches, this famous mountain was painted extensively by Paul Cézanne. The stunning view from the cross locally named “Croix de Provence” (945 m) reaches Sainte-Baume, the Luberon and the Étoile ranges, the valley of the Durance and the Provençal Alps. Next Article What do French people celebrate on Europe Day?